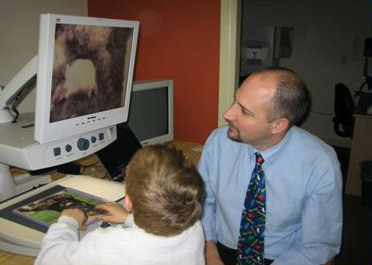 After assessment of the child and consultation with their team, the CLVP team will determine what Low Vision devices will be loaned to the student for use at home and school once the student has completed their visit through the clinic stations. Input from the student, the student's family, and the student's learning team is a vital component of the assessment. These include near and distance devices such as monoculars and magnifiers, as well as a variety of low-tech solutions. These are provided free of charge and are considered to be on loan for as long as the student is using them. If devices are broken or defective, they will be replaced. If devices are lost or stolen, please have the vision teacher of the student contact us, and depending on the circumstances, we might be able to justify replacement. If the student's vision changes or the devices loaned are no longer appropriate, they may be returned and/or exchanged for other devices. ﻿﻿Please email clvpbc@sd23.bc.ca if you wish to exchange a device received at a CLVP clinic.